The PADI Assistant Instructor course builds on the PADI Divemaster course, allowing you to gain additional dive experience as a PADI Pro. The big difference between being a DM or an AI is that in becoming an Assitant Instructor (AI), you begin to learn the PADI System of diver education. You can act as an instructional assistant and take over some teaching responsibilities completely. 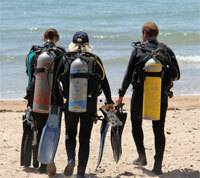 It's a fantastic way to gain experience in your progression to becoming an Open Water Scuba Instructor (OWSI). The PADI Assistant Instructor course can be done as a stand-alone course, or as the first part of an Instructor Development Course (IDC). When the AI course is followed by the Open Water Scuba Instructor (OWSI) portion of an IDC, with successful performance at the Instructor Examination (IE), this leads to certification as a PADI Open Water Scuba Instructor. Whether you're looking for a new challenge, seeking to expand your instructional capabilities, or just trying to decide if becoming an Open Water Scuba Instructor is for you, becoming a PADI Assistant Instructor is the logical choice.